Exciting news for young female book collectors: Brooklyn’s Honey & Wax Booksellers has announced an annual prize of $1,000 to be awarded to a woman aged 30 or younger with an “outstanding book collection.” The collection can include books, manuscripts, and/or ephemera, organized by whatever principle the collector deems appropriate to the material. Honey & Wax booksellers Heather O’Donnell and Rebecca Romney, pictured here at the New York Antiquarian Book Fair last year, took some inspiration for the collecting prize from the American book collector Mary Hyde Eccles. “Rebecca and I are both interested in the historic role of women in the rare book trade, on both the buying and the selling sides, and want to do whatever we can to get younger women involved,” said O’Donnell. The deadline is July 15, and the application details are here. Image courtesy of Honey & Wax. Exciting news for young female book collectors: Brooklyn's Honey & Wax Booksellers has announced an annual prize of $1,000 to be awarded to a woman aged 30 or younger with an "outstanding book collection." The collection can include books, manuscripts, and/or ephemera, organized by whatever principle the collector deems appropriate to the material. 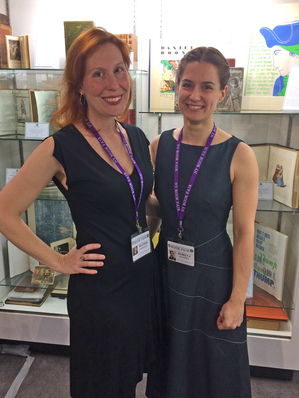 Honey & Wax booksellers Heather O'Donnell and Rebecca Romney, pictured here at the New York Antiquarian Book Fair last year, took some inspiration for the collecting prize from the American book collector Mary Hyde Eccles. "Rebecca and I are both interested in the historic role of women in the rare book trade, on both the buying and the selling sides, and want to do whatever we can to get younger women involved," said O'Donnell. The Honey & Wax Book Collecting Prize "rewards creativity, coherence, and bibliographic rigor," according to the announcement, and "collections will not be judged on their size or their market value." Entrants need not be enrolled in a degree program, a significant difference from similar collecting contests, and one that opens it up to a broader range of applicants. As O'Donnell said, "We want to give those women who have applied to their college book collecting contests and/or to the National Collegiate contest an additional chance to be recognized for their work, and we'd also like to reach out to bookish young women outside the academy."